I graduated from Bradford University with First Class Honours and two awards for the best marks in Contact Lens practical and theory in 1993. 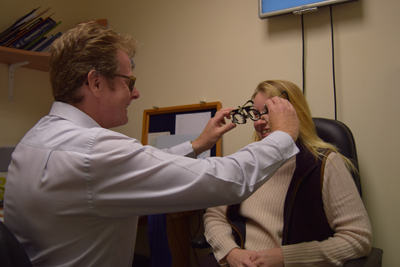 After passing the professional examinations the following year, I qualified as an Optometrist. My special interests within Optometry are treating Dry Eyes, fitting Contact Lenses (especially the latest Varifocal lenses), and Macular Degeneration. I have always been an advocate for new technology, being the first to bring Digital Retinal Photography to the area. Since 2010 we were one of the first practices in the county to offer the advanced ocular imaging which is OCT (Ocular Coherence Tomography). This enables us to see under the surface of the retina at very high levels of magnification. I have been married since 1997 and we have two girls. We are all RSPB members, and it is a good excuse to get outside with the girls and help them to enjoy and appreciate nature. I enjoy watching all forms of motorsport, including Formula 1. After years of putting it off, the urge to take part in motorsport finally got the better of me in 2004. Competing in 3 events that year in a Caterham 7, saw no turning back. The highlight was winning my first race in 2007. A phased return to the racing saw me take my second win in 2014 at Silverstone, and seal 4th in the Caterham SuperGraduates National Championship. I currently hold 2 Lap Records for Rockingham and Cadwell Park.